These projects say Welcome on one side and Gone Fishin' on the other. You can make a fish only, and flip it over or hang a plaque from the fish and turn just the plaque over. 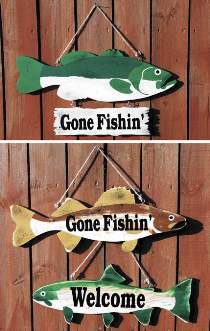 Plan includes FULL SIZE drawings for three fish including Bass, Trout and Walleye, as well as the hanging plaque. Fish measure 25"-27"L. All patterns drawn FULL SIZE. Order decals and screw eyes separately or see Special Offer which includes the plan, 3 Gone Fishin' decals, 3 Welcome decals and 20 screw eyes.